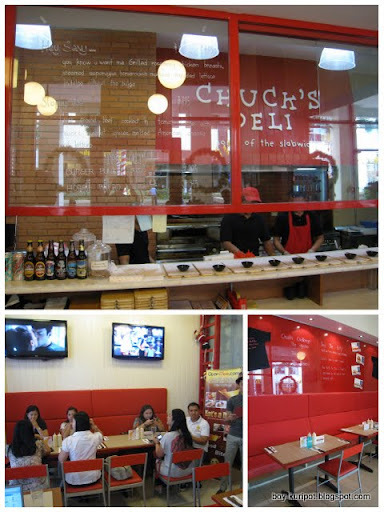 Chuck's Deli Buffy Challenge ~ Philippine Freebies, Promos, Contests and MORE! Are you up for a MEGA eating challenge like Bigby's Cafe Titanic Treat and Ridiculous Burger Challenge of Burger Avenue? Well, here's something to add to your list. 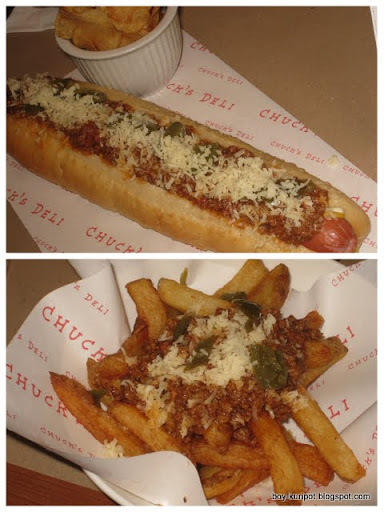 If you happen to pass by Eastwood or Serendra, drop by Chuck's Deli for their Buffy Challenge. Gobble down a full 10-inch slab of The Buffy slabwich within 5 minutes and you get it for FREE plus you get the awesome t-shirt (photo below) so you can go around boasting your achievement to everyone. If you fail the challenge, you have to pay the full amount of The Buffy slabwich plus a walk of shame. But if you're not up for The Buffy challenge just yet, you could try out Chuck Deli's other mouthwatering dishes which I made a review on below. If you are planning to take on the challenge, here are a few tips Chuck's Deli shared with us. The Buffy Slabwich has garlic sauce which is quite spicy. This might slow you down. You can tell the staff to hold the spice and they would gladly oblige. Most of those who completed the challenge didn't eat the slabwich as is. They first ate the bread before they ate the patty. The Buffy is a chicken slabwich with buffalo (aka Buffy) sauce. The level of hotness was just right for me. Compared to a buffalo chicken, I'd say they could improve on their sauce. It's OK but it doesn't quite hit the spot for me in terms of flavor. 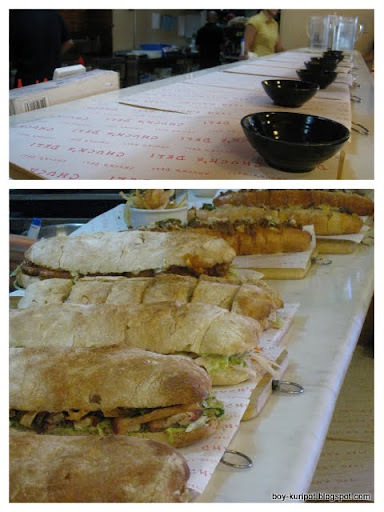 The Slabwiches are Chuck's signature super sandwiches served in 10-inch long Ciabatta bread. A slabwich weighs roughly around half a kilo and are sold in half or full sizes. Almost all of their food are home made. From bread, to sauces, to patties, to sausages, and chips. What I find impressive is the Ciabatta bread. It's cooked halfway in the commissary and fully cooked when someone orders a slabwich. This way, you don't bake the bread too much. I like the crunchy texture of the Ciabatta outside while retaining that soft spongy texture inside. The first time I've tried a Reuben sandwich was in Peninsula hotel. Boy was the price outrageous but it was darn good. I couldn't help comparing the Reuben slabwich of Chuck's Deli with the one in Peninsula. The taste wasn't exactly the same but it was rather close to the satisfaction of my palette. I just wished they put in more cheese in this. The Reuben of Chuck's Deli is made from homemade Angus corned beef, swiss cheese, sauerkraut, mustard with garlic sauce. You can also choose to go with the spicy garlic sauce for that extra punch. There's no typo in the title there. The Faking Duck is basically a slabwich that tries to imitate the taste of the peking duck by using the dark hoisin sauce used in peking duck. Instead of duck, the meat used here is pork. To complete the taste, leaks, lettuce and crispy noodles are added into the mix. I find his quite good. There's not too much fat on the pork so it's not greasy. California maki in a slabwich! The California Waki makes use of kani, mango, egg, lettuce and wasabi mayo to give you that california maki taste you love. I wasn't able to try this those eating it looked like they enjoyed it. I'm quite picky when it comes to burgers but Chuck's Burger just went to my top favorite list of burgers. The half-pound Angus beef patty was juicy and seasoned perfectly. I think even without the lettuce, tomato, spicy garlic sauce, and mayo mustard, this could still make me happy. I'm always all about the beef. A good burger always starts with a good beef patty. There's a spicy version of this burger which I didn't like. The chili just destroyed the taste of the patty. All the tables has 2 sauce containers. One is labeled garlic sauce while the other shows spicy garlic sauce. I think this is the same sauce they use for the slabwiches and burgers. This way, you don't have to ask for more sauce. The Footlong Chilidog is a classic footlong 'dog served on a fresh hoagies bun with chips or onion rings as sides. The Chilidog for me was just average. It didn't really leave an impression on me. So did the chili fries which used the same sauce. All slabwiches and footlong hotdogs comes with a sidekick of home-made chips or onion rings. The fries for me is a bit greasy but I did love the chips. The onion rings on the other hand was beautifully breaded to a crunchy texture. I liked the Power Shake which had lettuce, apple and orange blended together. All the fruit and vegetable flavors were in complete harmony. Refreshing and healthy. You can also try their imported beers and drinks. It's not listed on the menu but you can find it at the counter near the kitchen area.